Firstly, take the flour and soda, sieve it so that the even the slightest impurities are out. Then, mix the mixture with ghee. Also add curd to it. Mix it properly and make stiff dough. Then cover it with damp cloth and keep aside for sometime. Later, for say after an hour, make small round balls from this dough. Press these balls and make a depression in the center (to give the typical Balushahi shape). In a pan heat the ghee or oil and let it cool. Then pour these patties into it. Deep fry it on low flame and let it turn into pink color. But make sure that you do not turn the Balushahi until it changes color. Repeat the same for all Balushahi pieces. When you are done with all, drain the excess oil by placing it on tissue paper. Then dip it into sugar syrup. Allow it to stand for five minutes and then remove. 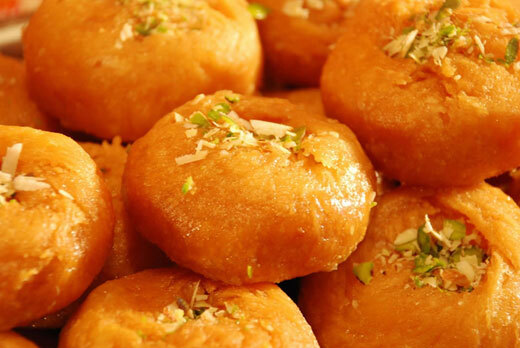 The delicious Balushahi is ready for the celebrations!